In the opening scenes of "Gordy," some men in a truck come to a struggling family farm to load up a mother pig and her piglets and cart them away. "Can't blame folks for selling their livestock; they need cash," they say, as if the natural inclination of farmers would be to support their animals until they die of old age. These are no ordinary pigs, however, as we discover when we meet Gordy, a piglet who luckily misses being shipped to the fattening-farm. Gordy is some pig. He speaks English, for example - in a high-pitched voice that's intercut with all sorts of snorts and squeaks. And he trots around on his little feet like a pig with a mission. He's determined to find his family and save them from hickory smoking. Gordy (who was born not far from the historic town of Hope, Ark.) hits the road, and is soon adopted by a little girl who sings with her father in a country band. Her name is Jinnie Sue MacAllister (Kristy Young), and she moves Gordy into her bunk in the family motor home. In one of those movie moments kids always especially like, her dad, a widower named Luke (Doug Stone), gets a good-night kiss from the pig and thinks it's his daughter. The odyssey continues. Luke's band plays at the governor's mansion, where a young boy named Hanky (Michael Roescher) falls into the pool and nearly drowns - until he is rescued, of course, by the quick-thinking Gordy. The pig becomes a hero (he even gets a call from President Clinton), and is adopted as the trademark of a company owned by Hanky's rich grandfather. Meanwhile, he still wants to find his family before they end up arrayed in slices on either side of a short stack. Pigs are not my favorite animal, but I am aware of the arguments that they are among the most intelligent of the barnyard animals (they're smarter than horses, according to Johnny Carson, who had a long-running debate on the subject with Ed McMahon). Gordy, however, has a certain (very limited) charm, and the human story - which has the single parents of Hanky and Jinnie Sue falling in love to country music - has a cornball appeal. This is not the kind of film that rewards deep analysis. I rate it at two stars, but I'd recommend it for kids. 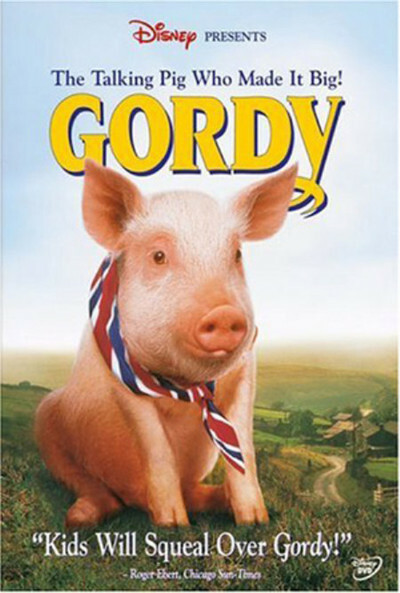 I can't recommend it for people like me, but there are many other kinds of people in the world, some of them children who believe that pigs can talk, and for them, "Gordy" is likely to be very entertaining. You know who you are.